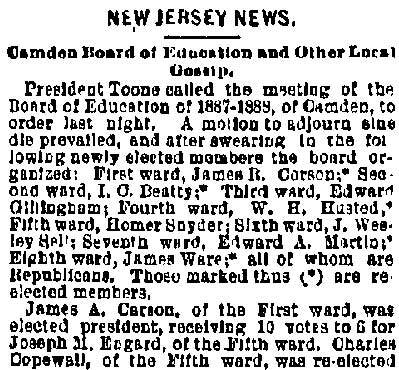 Camden People - James Ware Jr.
JAMES WARE JR. was born in Philadelphia, Pennsylvania in August of 1854 to James and Mary Ware. He was the oldest of at least five children, coming before brothers John, William, and George, and a sister, Isabella. 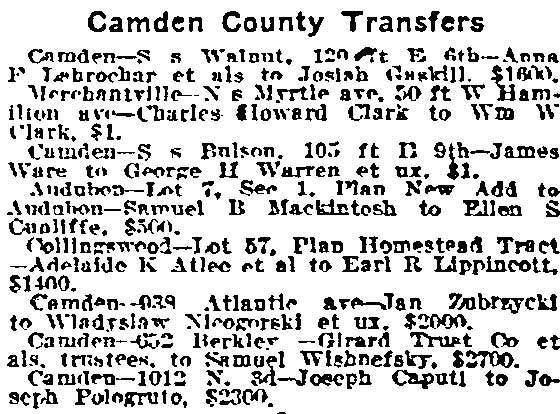 The family came to Camden after the Civil War. 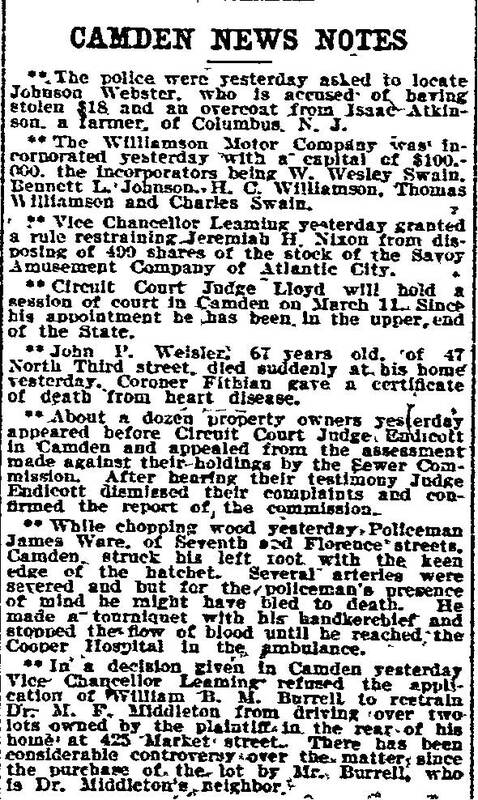 James Ware Sr. worked as a "ship's joiner", that is to say, as a ship's carpenter. 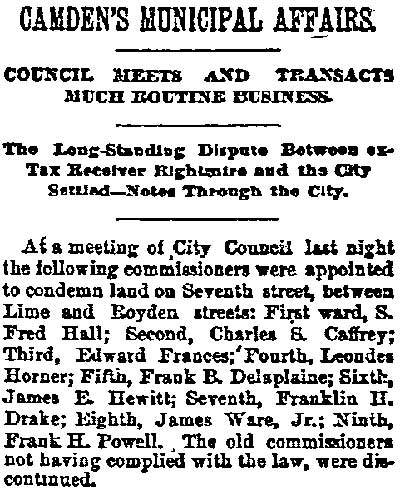 The 1878 City Directory James Ware Jr. lived on Ferry Avenue near Bem Street (since renamed South 7th Street). 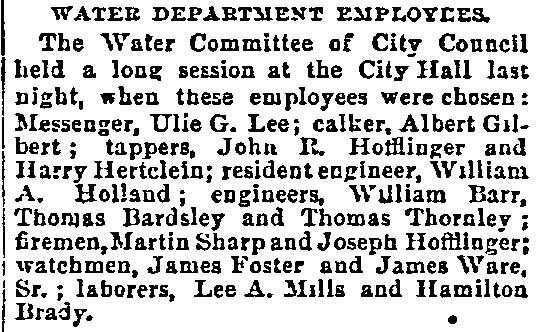 James Ware Jr. was then a laborer, but was destined for better things. 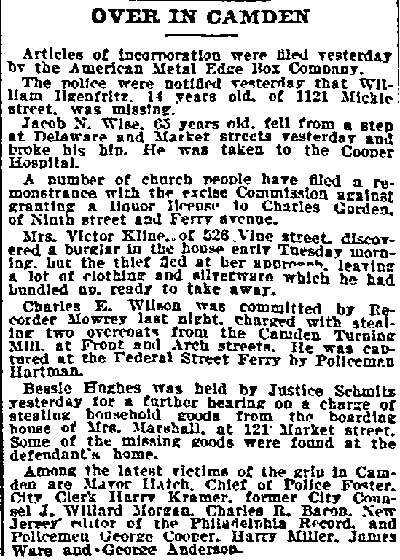 His parents, brother John Ware, and the younger siblings were living on Kossuth street south of Ferry Avenue. 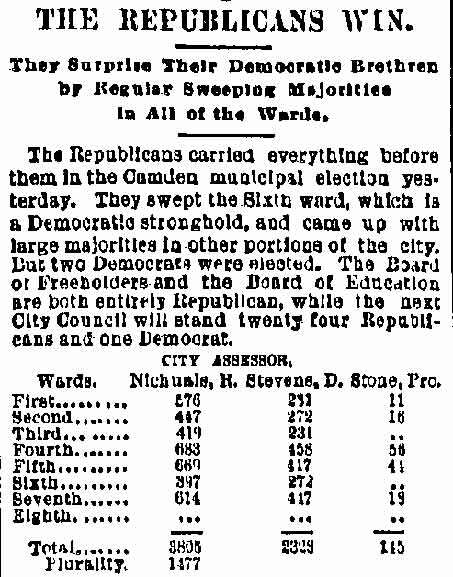 When the Census was taken in 1880 James and Emma Ware and children Rebecca and Joseph A. Ware were living in Camden's Seventh Ward. 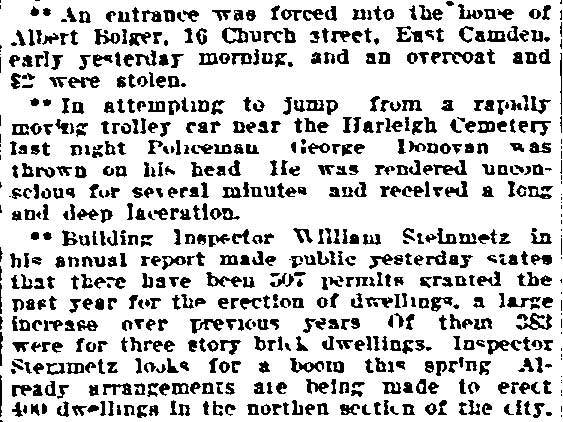 His parents and siblings were all still residing on Kossuth Street. 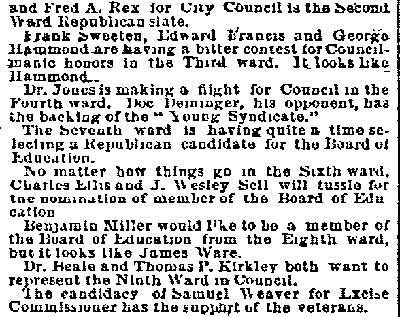 James Ware soon returned to the Eighth Ward and became active in politics as a Republican. 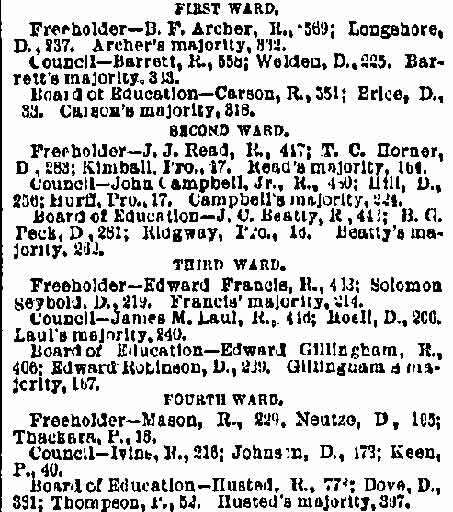 The 1887 Directory shows James Ware living at 1713 South 6th Street. 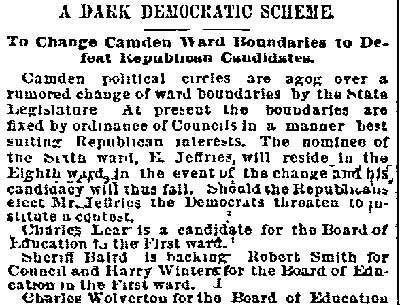 By 1890 his political activities had paid off, as he had been appointed Superintendent of Camden Cemetery. 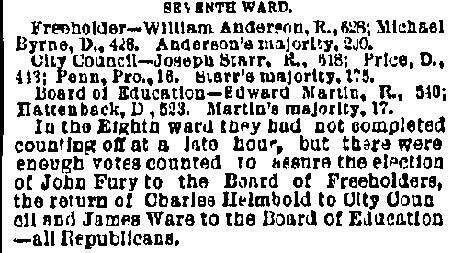 In 1888 James Ware Jr. was elected to the Board of Education from the Eighth Ward. 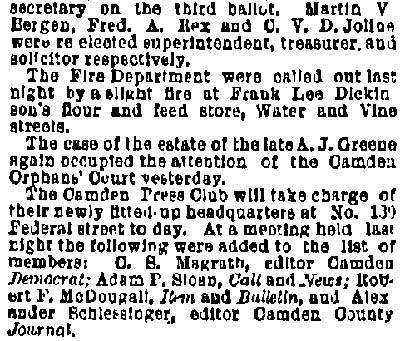 A measure of his influence in local politics is shown by the fact that is brother John Ware was appointed to the Fire Department in 1890, and his father a job with the Water Department in 1891. 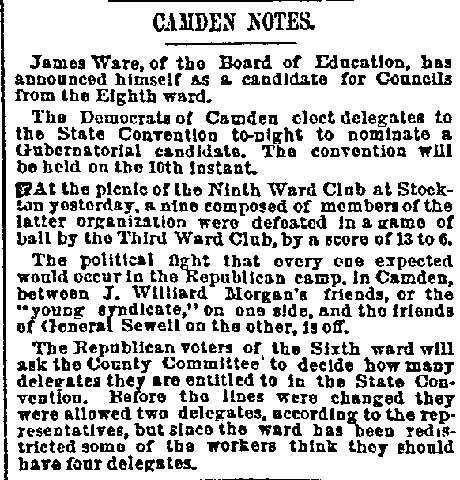 James Ware Jr. was considering a run for City Council but withdrew from the race in March of 1892. 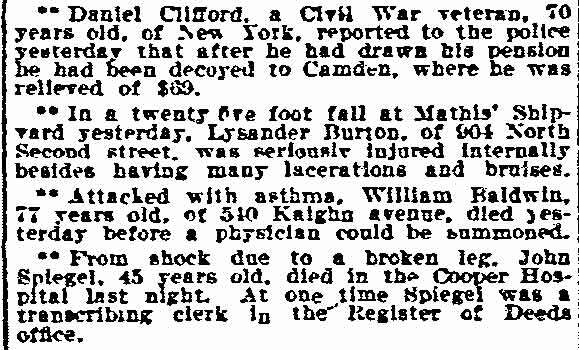 This may have had something to do with the health of his wife, Emma. 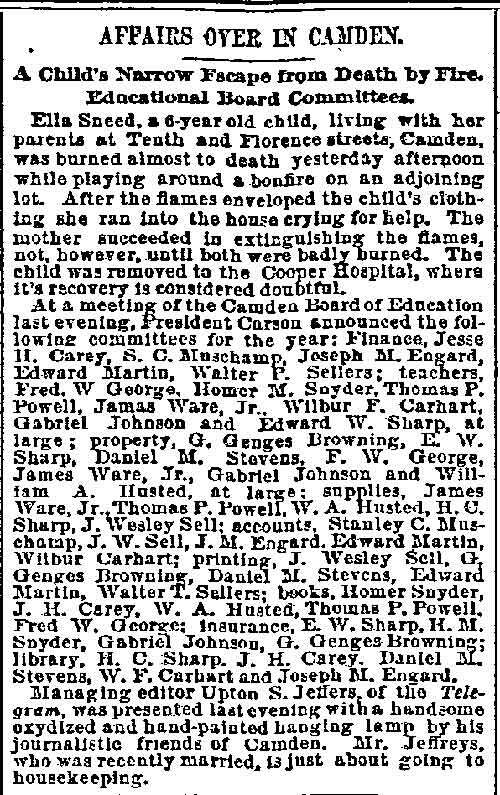 Sadly, Emma T. Ware died in October of 1893, leaving her husband to care for their four children- Joseph, aged 15, Rebecca, aged 14, Jesse, aged 9, and two year-old Emma. 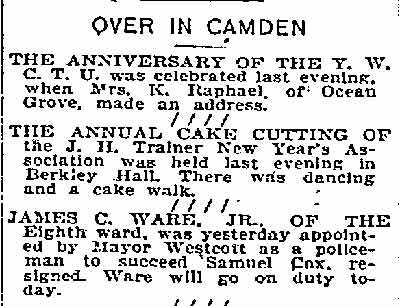 James Ware remarried in 1895. 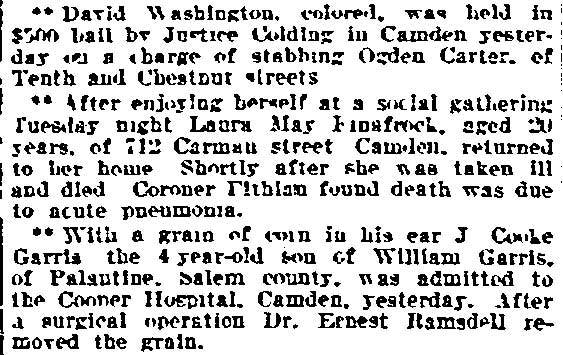 His new wife, Harriet, was a young widow about 20 years his junior, with a son. 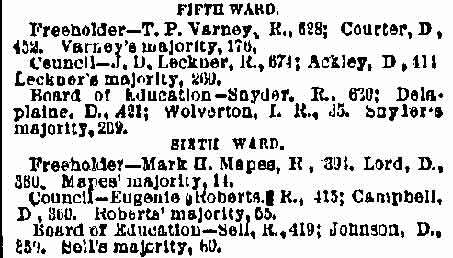 The marriage produced two daughters after 1900, Evelyn and Marie. 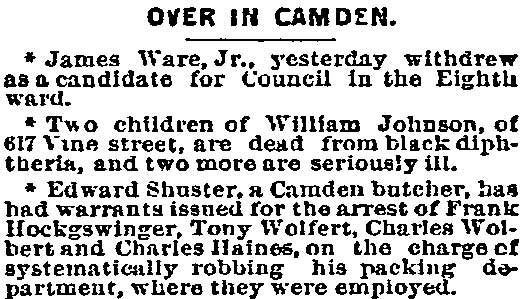 The couple remained together until James Ware's passing in the early 1920s. 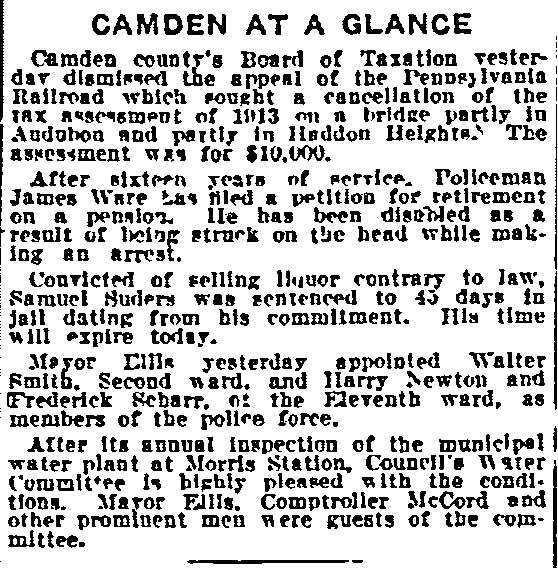 In January of 1898 James Ware was appointed to the Camden Police Department. 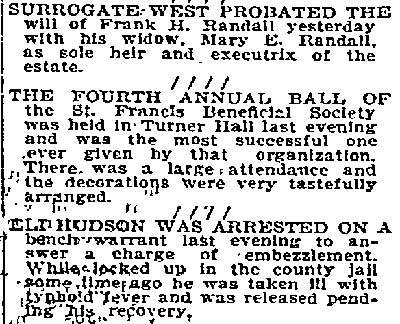 He served until 1914 when he filed his retirement papers, after having been injured while making as arrest. 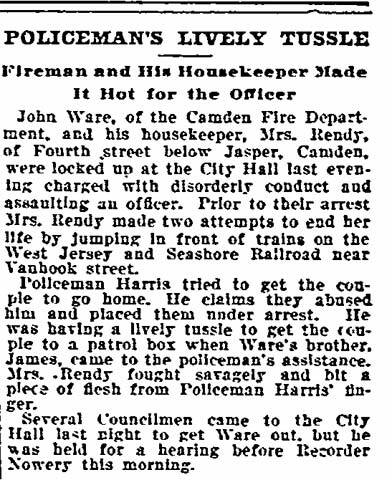 Tragedy again struck that year when his eldest son, Fireman Joseph A. Ware, was died in July after being injured in the line of duty the previous month. 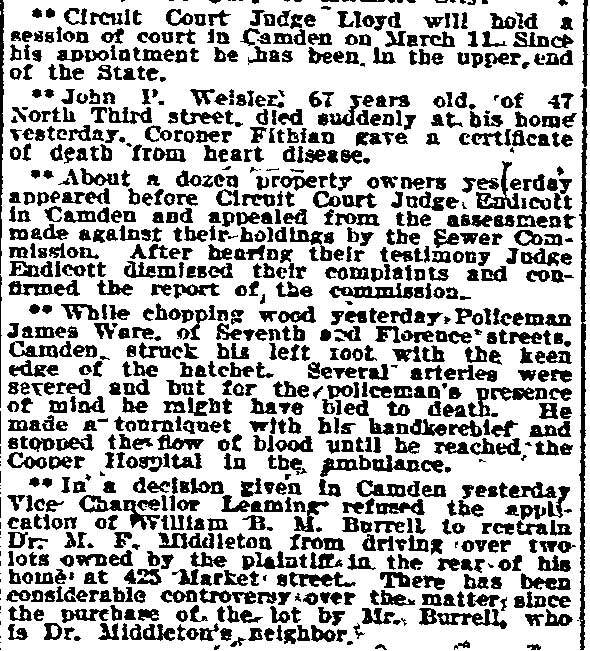 James Ware Jr. was still living in the Eighth Ward when the census was taken in January of 1920. 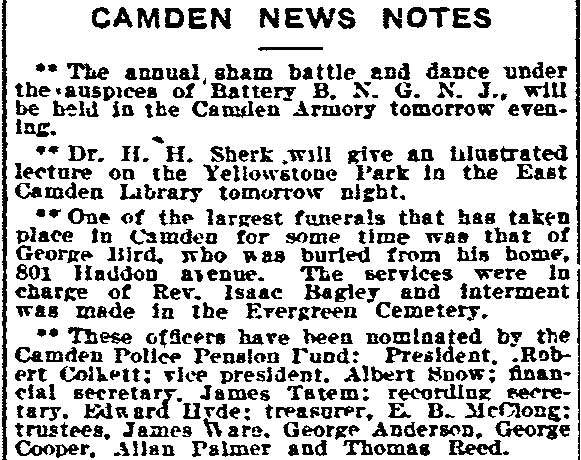 By the time the 1924 Camden City Directory was compiled he had passed away. 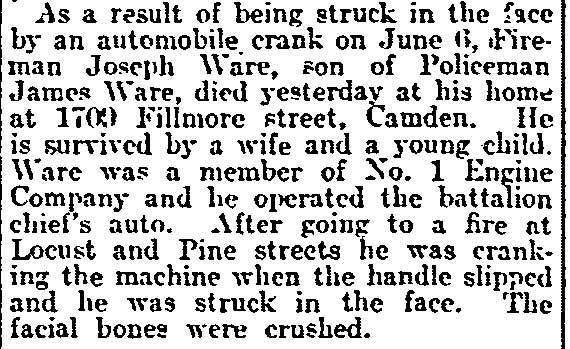 Joseph Hofflinger - James Foster - James Ware Sr.